Welcome to the launch of our brand spanking new website! With this new portal we will be better able to let you know the exciting things going on at Story Planet and how you can be involved. Take a tour around this corner of our universe and let us know what you think. We’d like to send out a blackhole size thank you to Context Creative without whom this site would never have been possible. And a special shout out to Mary at Context, who was an absolute dream to work with! As a boy, Eric Kim never imagined he would one day work as an illustrator. But he has used his “humble beginnings” to connect with the Bloordale community through art. Eric Kim is a supernova at Story Planet. He has leant his considerable talents (he’s awesome at computer animation and has a Bachelor of Arts Illustration degree from Sheridan College) to Story Planet as a volunteer and artist at our workshops – everything from drawing characters at Alpha workshops to leading a seven week Manga for Girls workshop. Eric loves that Story Planet does what he enjoys doing – making stories and giving young students a chance to create. He believes that “being comfortable with being creative is at the heart of Story Planet”. Eric will continue to work with us in any capacity because he thinks storymaking bridges gaps – inspiring kids to become engaged and involved in their community. 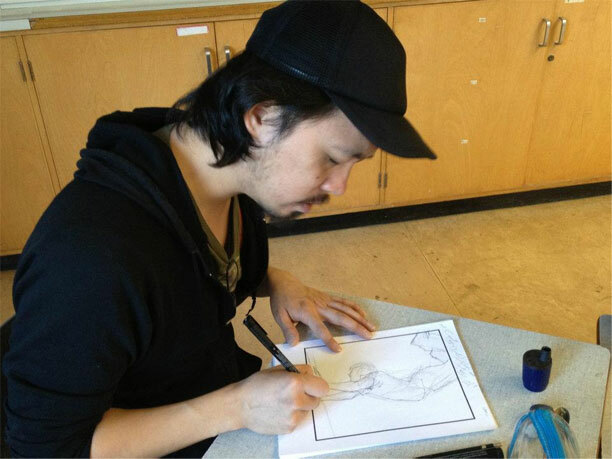 Eric is currently working with Manga Dojo to offer workshops to students ages 13-17. This workshop series encourages Canadian talent and spreads the message that anyone can draw comics and publish at any age. He is also working on a book titled Billy Smoke which should hit shelves in 2013. It’s a tie between Snow Crash, by Neal Stephenson, and Neuromancer, by William Gibson. The rest of the books by those two authors come in a close second. Rumiko Takahashi. Also, Inio Asano is a real treat to read. Keep an eye and/or tentacle out for our new website! See if you can crack the code to play “Space Invaders” on our site! We had a great article written about us in the National Post this past weekend! Big on Bloor was this past Saturday. We had a great time getting to share our story with everyone! We’re so excited to announce our alien-drawing contest winner! This magnificent creature dubbed “Bieber” has been picked out of the raffle and the lucky winner will receive a free t-shirt. Learn how to make your own comics from start to finish! Drawing, inking, writing – you will learn the fundamental skills in making your own stories. Works will be collected into a small booklet that you will be able to take home at the end of the sessions. Participants must register for all 6 sessions.